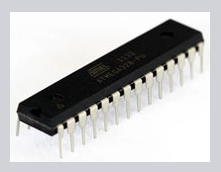 ATmega 328 is the single chip Microcontroller from Atmel and belongs to the mega AVR series. Atmel corporation is an American based designer and manufacturer of semiconductors founded in 1984. ATmega328 is now widely used in many projects where low cost microcontroller is needed. The most common implementation of ATmega328 is on the Arduino development platform namely Arduino Uno and Arduino Nano boards. A low power alternative of ATmega328 called ATmega328P is also used now which is a pico power version.